The giraffe gives birth to its baby standing up, so the first thing that happens to a new-born giraffe is a fall of about two metres. 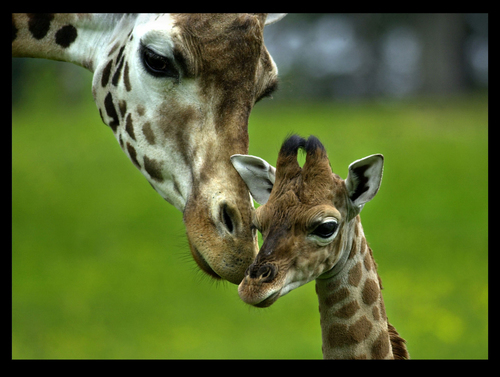 Still dazed, the baby tries to stand up on its four legs, but its mother behaves very strangely: she gives the baby giraffe a gentle kick which sends it sprawling. It tries to get up and is again knocked down. This process is repeated several times, until the new-born giraffe is too exhausted to stand. At that point, the mother kicks it again, forcing it to get to its feet. After that, she does not push the baby giraffe over again.